NGC 520 — also known as Arp 157 — looks like a galaxy in the midst of exploding. NGC 520 — also known as Arp 157 — looks like a galaxy in the midst of exploding in this amazing space wallpaper. In reality, it’s the exact opposite. Two enormous spiral galaxies are crashing into each other, melding and forming a new conglomerate. This happens slowly, over millions of years — the whole process started some 300 million years ago. The object, about 100 000 light-years across, is now in the middle stage of the merging process, as the two nuclei haven’t merged yet, but the two discs have. The merger features a tail of stars and a prominent dust lane. 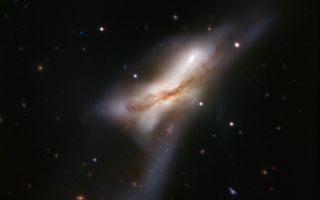 NGC 520 is one of the brightest interacting galaxies in the sky and lies in the direction of Pisces (the Fish), approximately 100 million light-years from Earth.